The other morning, I followed a link on Twitter from my friend, Simon Ensor, to a post about connections and disconnections. I’m a regular reader of Simon, and as always, he had me thinking as I was reading over cup of coffee and then, even more thinking, afterwards. I wanted to leave a thought for Simon at his blog, a little flag in the ground to say: I read what you wrote, and it affected me, and now my brain is thinking, wondering, working. A few seconds after posting a short comment, I realized that what I really wanted to do was write a poem, that the disparities of the world that Simon wrote about — of a former student struggling to keep power, literally, flowing in order to get a message out to the world — were part of a larger issue of access and technology in the world. So, I did. I wrote a poem, and shared it with him as a comment. Interestingly enough, the poem moved into the opposite direction: it was a poem of relationship of connections between two people. I was working to get at the narrow vision in order to make a point about the larger concept of how we decide where we will spend our energy connecting. I didn’t realize that until I was done writing the poem. I wish there were more poems sitting in my blog’s comment bin. No pressure if you are a reader of blogs (and we bloggers don’t need a deluge of poems, but dang, that would be cool). Still, it seems like the whole idea of reading and getting inspired is to take that inspiration, and move it into art of some sort, and then share it back. It creates this “reverberation effect” with the writer. It breaks down the walls between reader and writer. It makes the writing have meaning in new ways. 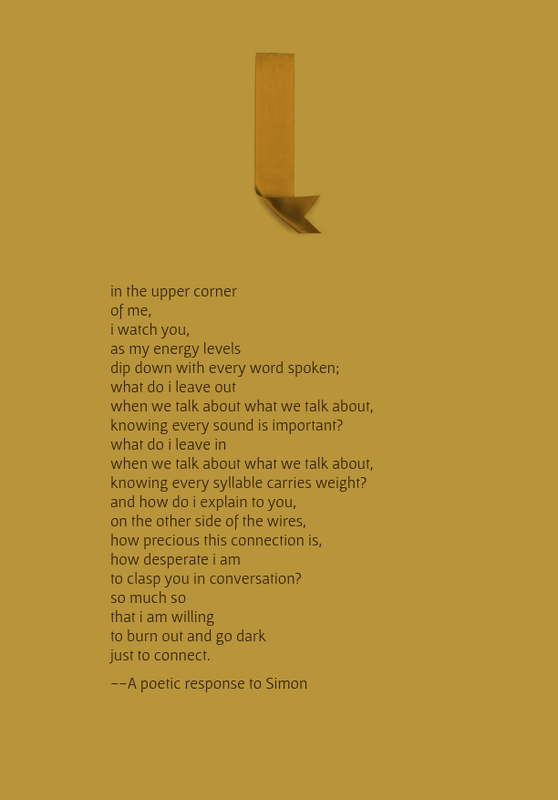 I know many people are uncomfortable writing poems, never mind writing poems on the fly while reading blog posts, and then, to add to the pressure, posting it on a public space. It’s just one of those things that came to me as I was writing this post about Simon, creating a larger reverberation. Maybe the ripple will allow you to float on a poem one of these days.